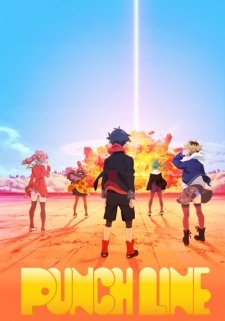 Here are my favorite picks for anime like Punch Line! Keep in mind the list is in no particular order. Enjoy the recommendations! Honnouji Academy—where an elite group of students is granted superhuman power by their special uniforms called the “Goku uniform.” With the power of the uniform, the student body president, Satsuki Kiryuin rules the students with unquestioned power and fear. Satsuki holds the secret to the “scissor blade” and Ryuuko confronts Satsuki to gain information but… Was their encounter a mere coincidence or fate? The clash between the two will soon consume the whole academy! 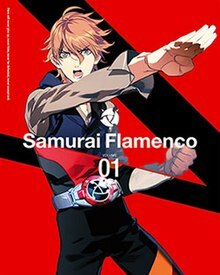 Masayoshi Hazama: a man who has become a superhero “by himself” with no superhuman powers or any sort of high-tech conversions, NONE!! Hidenori Goto: a cop who found out the true identity of “the superhero” by a strange twist of fate and thus constantly gets in trouble thanks to Hazama, the superhero. This is the story of the birth of a true hero featuring these two young men with a touch of comedy and serious drama, while they come face to face with hardships as they search for the true meaning of becoming a hero of justice in this world! In the small village of Jiha, Simon, a shy boy who works as a digger discovers a strange glowing object during excavation. The enterprising Kamina, a young man with a pair of rakish sunglasses and the passion of a fiery sun, befriends Simon and forms a small band of brothers, the Gurren Brigade, to escape the village and break through the ceiling of the cave to reach the surface, which few believe exist. The village elder won’t hear of such foolishness and punishes the Brigade. 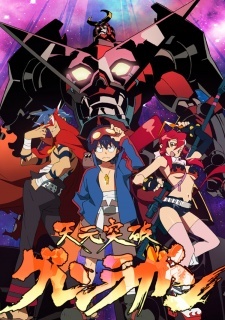 However, when disaster strikes from the world above and the entire village is in jeopardy, it’s up to Simon, Kamina, a girl with a big gun named Yoko, and the small yet sturdy robot, Lagann, to save the day.